To pickel Salmon. Take your Salmon, and boil it in salt and water, when 'tis boil'd enough take it out, let it stand till 'tis cold: Then put a third part of white-wine vinegar into the liquor, and boil them well together, then let it stand till 'tis cold, then put your Salmon in, and 'twill be fit for use. To pot a Hare. Take your Hare and bake it in a pot with a little whole pepper and when it comes out of the oven, cut it in pieces; then beat come cloves, mace, and nutmeg together well: Take a broad pan, and make a laying of your meat and a laying or your spices, till it be all in; Oyl some butter and pour over it, till it is well cover'd, let it stand till 'tis cold, and twill be fit for use. To pot Herrings. Take your Herrings, and scraps and wash them in (?) water(?) very clean, then cut off the heads and tails, then take a coarse clean cloth and wipe them very dry, but in the inside (?) you'll find a black skin, (?) 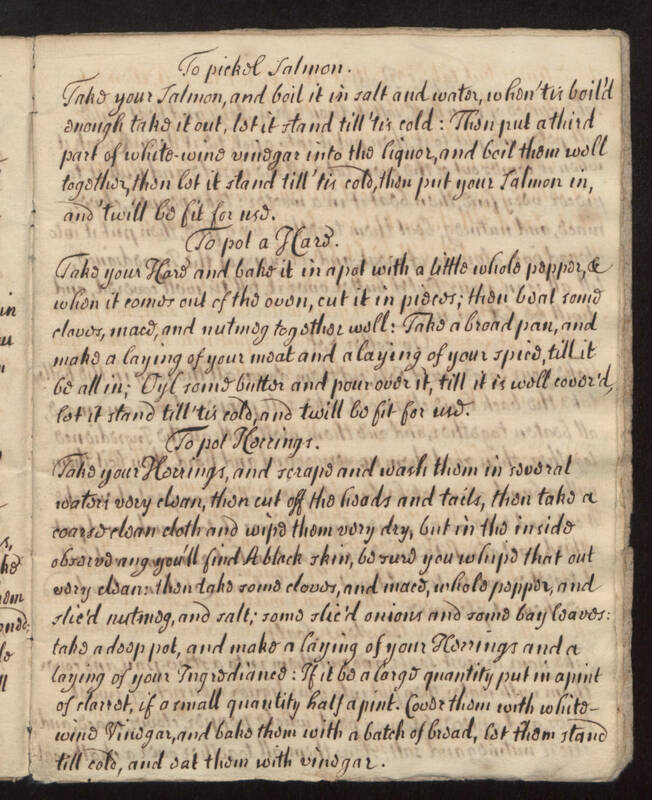 you whipe that out very clean: then take some cloves, and mace, whole pepper, and slic'd nutmeg, and salt; some slic'd onions and some bay leaves: take a deep pot, and make a laying of your Herrings and a laying of your Ingredianes: If it be a large quantity put in a pint of clarrot, if a small quantity half a pint. Cover them with white wine Vinegar, and bake them with a batch of bread, let them stand till cold, and eat them with vinegar.